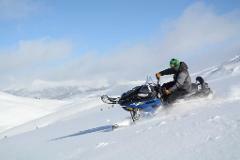 BEST AND HIGHEST SNOWMOBILE AND ZIP LINE TOURS. 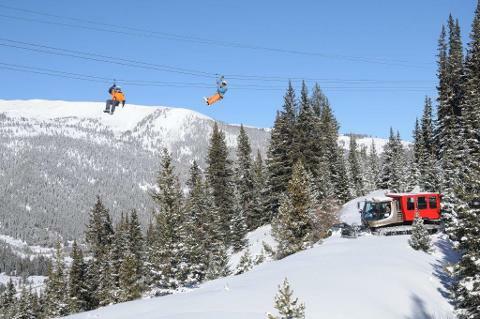 BOOK THE 5-HOUR THRILL SEEKERS COMBO WITH A 2-HOUR GUIDED FAMILY SNOWMOBILINGTOUR PLUS ALL SIX SECTIONS OF THE TOP OF THE ROCKIES ZIP LINE TOUR. INCLUDES LUNCH. Guide Gratuities are not included. 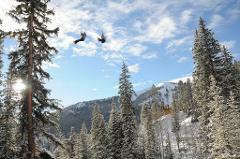 Tips are customary for both Snowmobile & Zip Line Guides. Escape the crowded ski resorts of Breckenridge, Copper Mountain, Vail and Keystone and come to a place where mountains meet the sky in total peace and tranquility. See the Rocky Mountains from areas never before accessible to the public. Our spectacular 2,500 acre property rests in the shadow of the Great Continental Divide on the splendid slopes of Mt. Arkansas, an "almost" Fourteener at 13,795 feet. You may see wildlife and you will see mountains, streams and waterfalls, but you will not see a single hotel or condo, not even on the distant horizon. We are only 2 hours from metro Denver, 45 minutes from most ski areas and just 14 miles south of Copper Mountain from Exit 195 on Interstate 70. Check in time for the Combo 8:30 a.m.
Plan to be on time so you will be able to do your paperwork, add additional clothing if desired and get ready for a fantastic adventure. Tour Starts at 9:00 a.m. ENJOY THIS RARE MIXTURE OF EXCITING INGREDIENTS FOR THE BEST TOUR IN THE AREA. Meet your trained and certified zip line guides. These friendly guys and gals will be with you for the entire zipline course. They have been trained on the course and are keen to make sure you feel happy, safe and unafraid. Guests say our zip line guides are great with Fraidy Cats and you'll feel more confident once you have completed A safety briefing and training zip line before starting the course. We use various types of snow cat vehicles to get guests up the steep scenic winding mountain trails from Base Camp at 10,000' to the first departure deck at 11,500'. The type of shuttle vehicle depends on the snow and trail conditions.All departure decks are at ground level for easy access. They slope slightly downward so you take a little stroll, a few steps, before gliding away. All zip lines have double overhead cables. You are hooked to both the upper and the lower cable with separate carabiners and on the harness with a double hook-up as well. You will do SIX separate zip lining sections, each with entirely different elements of terrain, speed and distance off the ground, all with long cables up to 900 feet. Our automatic braking system eliminates the need to self-brake. This is particularly important for families with children. FLY SIDE BY SIDE on Twin Zip Lines on 4 Sections of the Zip line, then enjoy one single zip line though a narrow area in the forest, then the grand finale is Zip Line #6 called the BIG NUGGET because of the mining history of the area. 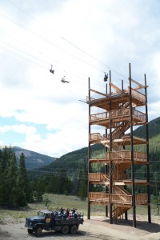 The Big Nugget is a Triple Zip Line with three cables leading to the landing on our 100' Sky Towers. These lines are the longest and fastest on the course. Return to earth on wide stairways and rest on six spacious landings. Pose for photos surrounded by some of the allest mountains in North America. Participants must weigh at least 50 pounds. We do not do tandems. Maximum weight is 260 pounds. You must be able to walk short distances on downhill trails between the zip line areas. You must be in good health and not under the influence of alcohol or drugs. Pregnant ladies cannot zip line. All participants must sign a standard liability waiver before touring. All participants must provide a credit card in the event of damage. 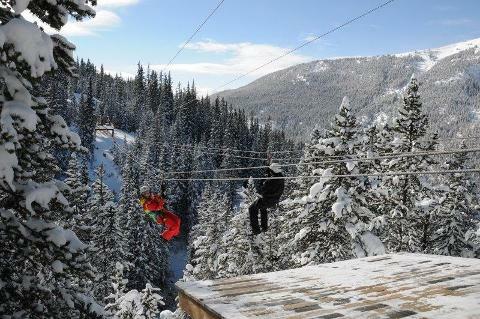 Top of the Rockies Zip Line is inspected yearly and registered with the State of Colorado. most sizes (although personal ski apparel and boots is perfectly acceptable). Bring sunglasses or goggles for eye protection. This two-hour tour takes place at the Turquoise Lake riding area. After check in at Base Camp on Highway 91, drivers will shuttle riders minutes away to our Turquoise Lake satellite base in one of our passenger vans or larger people movers. In the summer months the beautiful Turquoise Lake Recreation Area is well-known for boating and fishing, hiking, camping and other uses, but in winter, the roads are trails are restricted to snowmobiles and other winter usage. This vast area is framed by 14,000' Mount Massive and Mount Elbert to the south, providing spectacular views and sunsets. We ride on the county roads, into endless snowy meadows and Forest Service areas by special use permit. This ride is perfect for families with children, single riders looking for a scenic ride or couples who want to ride together on the same snowmobile. Groomed trails make this an exciting and enjoyable ride for all levels of experience. Tour groups are small, usually four to six snowmobiles. Parents will enjoy a short stop so children up to 70 pounds can take a turn driving a "Kiddie" Polaris snowmobile in a snowy meadow while other guests enjoy free time riding in a practice area. PROSPECTOR /Zip Line TOUR RESTRICTIONS: Minimum age for driving a snowmobile is 15 with a Learners Permit or other legitimate driving experience. Must be 18 to carry a passenger. Riders cannot be under the influence of drugs or alcohol. Pregnant ladies CANNOT participate. Minimum Weight for zip line is 50 pounds, maximum is 260 pounds. All participants must sign a standard liability waiver. most sizes. Bring Gloves, Goggles or sunglasses. A hearty box lunch is provided made by City on a Hill Restaurant in Leadville. Water, Hot chocolate and other hot beverages are complimentary. ARRIVAL TIME FOR THE COMBO IS 8:30 a.m. Customary Guide Gratuities are not included in tour price. The amount is at the discretion of the customer. PHOTOS AND VIDEOS. PURCHASE IS AT THE DISCRETION OF THE CUSTOMER.